yourFXguide- Elliott's Wave Principle has been being applied in financial market trading since it was developed by the gentle man R.N. Elliott. The goal of the theory is not to help the traders in finding entry and exit signals rather in understanding the market behavior. This post explains an effective way to predict the fifth wave of Elliott's impulsive five waves. The principle presented along the post is " (1) When the top of the third wave of impulsive five waves reaches at the 261.8% fibonacci retracement level of second wave, little upper or little lower, the 361.8% fibonacci retracement of second wave indicates the top of the fifth wave. Or (2) 161.8% fibonacci retracement level of fourth wave indicates the top of the fifth wave" This theory is illustrated above. The above illustration seems difficult for the beginner traders. Do not worry, we are going to apply the theory on the practical price chart. From the above theory, we came to know that the top of the fifth wave has to be confirmed by two fibonacci retracement levels 361.8% of second wave and 161.8% of fourth wave.The most important condition is that the top of the third wave must be at 261.8% fibonacci retracement of second wave, little upper or little lower. In the above candlesticks chart, we can see the top of the third wave is little higher than the 261.8% fibonacci retracement level of second wave. So the first condition is meet, and it suggests that there is higher probability that the top of the fifth wave might be at the 361.8% fibonacci retracement level of second wave. 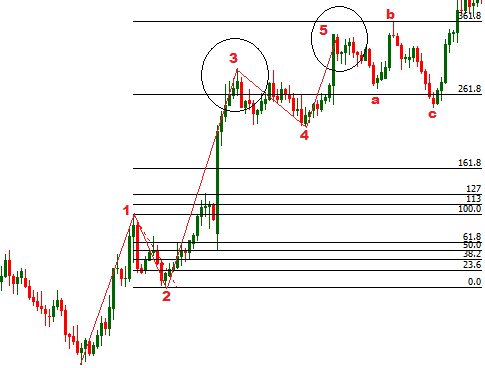 In the above illustration, we have drawn a fibonacci retracement tool starting from the beginning of second wave to the end of second wave, and we just found the fibonacci retracement levels greater than 100%. And we can see the top of the fifth wave is just bellow the 361.8% fibonacci retracement level of second wave. Now we are going to find the 161.8% fibonacci retracement level of fourth wave, which is another condition of the theory. 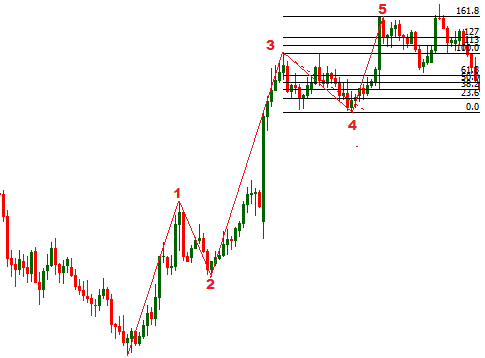 To find it we have just drawn a fibonacci retracement tool from starting of fourth wave to end of fourth wave. See the illustration below. In the illustration we can see that the top of the fifth wave is exactly at the 161.8% fibonacci retracement level of fourth wave. 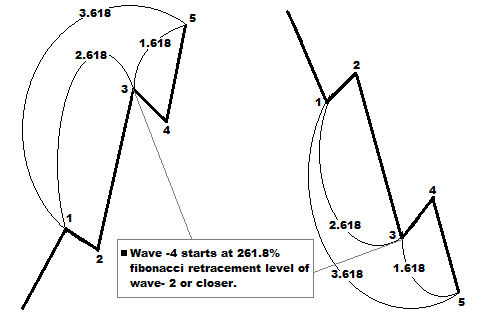 Actually, the above mentioned theory can be rewritten as follows-" When the top of the third wave of impulsive five waves reaches at the 261.8% fibonacci retracement level of second wave, little upper or little lower, the top of the fifth wave lies between the 361.8% fibonacci retracement of second wave or 161.8% fibonacci retracement of fourth wave." Dear Traders, practical market situations are very challenging to us, and no theory is 100% accurate in the market. For example, According to the Elliott's Wave Theory, the third wave should be the longest wave, but in practical market pure Elliott's Impulsive Five Waves are rarely found. There are no alternative ways to solve these problems except acquiring knowledge and gathering experience. I hope this theory will improve your trading experience and enrich your knowledge to understand the market behavior more satisfactorily. If you have any question regarding this post, you can drop it into the comment section below.